Next week, the Pokémon anime will air its 1000th episode. The show and game are still capturing the hearts of children around the world, just like they captured mine 20 years ago. When I was eight years old, every day I’d hurry home as fast as possible to catch Pokémon on TV. I didn’t have the game yet (and wouldn’t until I begged my parents for a GameBoy for Christmas), but I was completely enthralled by the world of Ash Ketchum. With his buddies Brock and Misty, he befriended a series of bizarre animals and learned about what it takes to be a Pokémon Master. At this point Pokémon has so saturated my life that it’s hard to describe what it meant to me. Was it especially good? Well, Team Rocket was funny, but man, Ash was a boring, dumb kid and the plot of the show made no sense. Was it especially well-animated? No. Did it impart any valuable lessons? I mean, kinda, but “work hard” and “be nice to your friends” were messages so ubiquitous in kids’ shows that I kinda tuned them out. Understanding the appeal of Pokémon as an overall franchise is easy. As a deeply competitive kid with severe allergies, the fantasy of owning multiple pets and also being the best at something appealed to me. It was also a way to relate to the kids at school. My fondness for reading and extreme awkwardness sometimes made me a bit of an outcast, but everyone was watching and playing Pokémon. At recess, we’d gather together and try to recite the Poké Rap from memory—I was never very good at it. Still, by the time I actually had the game, I recognized most of the 151 Pokémon that I chucked my pokéballs at. It helped that Pokémon was just different enough from the other cartoons I watched. This was my first exposure to anime, and my tiny little child brain couldn’t handle it. Despite animation that I now recognize as, at times, pretty garbage, it seemed so alive and vibrant compared to the other things I was watching. 1997, the year Pokémon started airing, was a pretty good year for American animation. As good as PowerPuff Girls and Johnny Bravo were, Pokémon gave me a window into a style of animation that hadn’t yet saturated the West. Once I realized that there were more shows in the same style, I started watching anime voraciously. It was, honestly, all about the eyes. 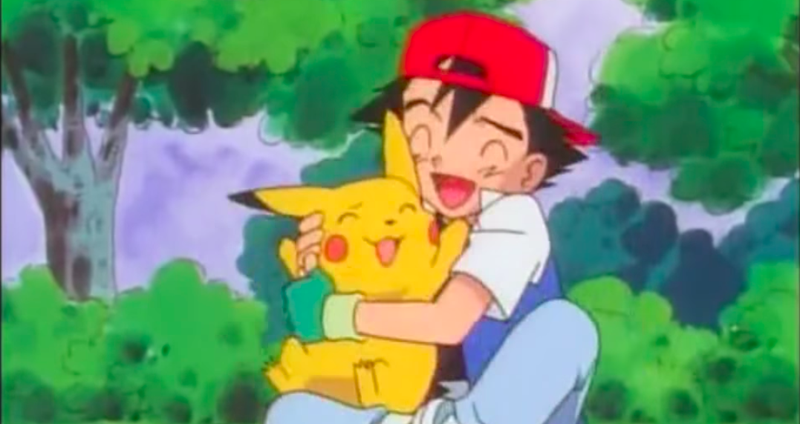 Pikachu, a character that could only say its own name, delivered an enormous amount of very human emotion through its eyes. Pikachu’s eyes would water and cry, squint in frustration, or close when he concentrated hard. He felt so alive to me. I wanted to protect him. I needed to have one of my own. Americans weren’t watching the same show that aired in Japan, but it didn’t really matter. I was too young to really grok that this was a show that wasn’t produced in America anyhow, and the changes to the source material helped Pokémon stick in my head. Many of the classic catchphrases from the show—Team Rocket’s motto, the tagline of “Gotta catch ‘em all”—come from 4Kids’ dub of the series. While they would later be rightly derided for butchering classic anime franchises, 4Kids did make a few smart adaptation choices that gave Pokémon staying power in the West. Pokémon was a license to print money, and if that meant renaming the characters Musashi and Kojiro to Jesse and James, tying them to a reference that makes sense in the West but was not present in the original, then so be it. My experience was far from unique. This show, and the game that accompanied it, was a phenomenon. Over 20 years later it’s still going strong. Things like the Poké Rap have become cultural touchstones among my peers. Many of them never played another Pokémon game after Red and Blue, but they remember the lyrics to the show’s theme song. As time has gone on, Ash Ketchum has been joined by new friends, bested new enemies, and caught more of the expanding roster of pocket monsters. He’s still the star of this adventure, and even if my peers and I have moved on, little kids still love him. They still dress up like him for Halloween, they still want Pikachus of their own, and they still dream of being the very best, like no one ever was.